You will have until May 1, 2019, to renew your tickets and per seat annual Bobcat Club contribution. If you have not done so by this deadline, your tickets WILL be released to the individuals on the waitlist. Once you have received your football renewal email, please call the Bobcat Ticket Office at (406) 994-CATS (2287) to be placed on the waitlist. The Bobcat Ticket Office will process your ticket renewal form within 7-10 business days from receiving it. If you are on the waitlist, your current seats will be saved for you until you are contacted regarding your request. We will begin calling those on the waitlist the second week of May to go over your options. Please note: It usually takes several weeks to go through the waitlist. One large mailing consisting of tickets, parking passes, tailgate passes, and other necessary correspondence will be sent in August. A $25 per seat annual Bobcat Club contribution will be included in your football season ticket price bringing the total price to $250 per season ticket. Reserved parking and tailgate parking prices will not change for the 2019 football season. The majority of the reserved parking areas surrounding Bobcat Stadium will still require a minimum $500 Bobcat Club contribution to purchase. Visit the Bobcat Club Football/Tailgate Parking Map for pricing and additional information. The Bridger Steel stadium club is located on the third floor of Bobcat Stadium. Stadium Club access is available to football season ticket holders who contribute at least $900 to the Bobcat Club annually. Cost is $257 per season ticket (cost is in addition to the actual season ticket price and per seat annual Bobcat Club contribution). Access is limited. Please call the Bobcat Ticket Office at (406) 994-CATS (2287). On approximately June 4th, we will open any available seats to new season ticket holders. Most of our seats available will be on the sideline in sections 108-114. 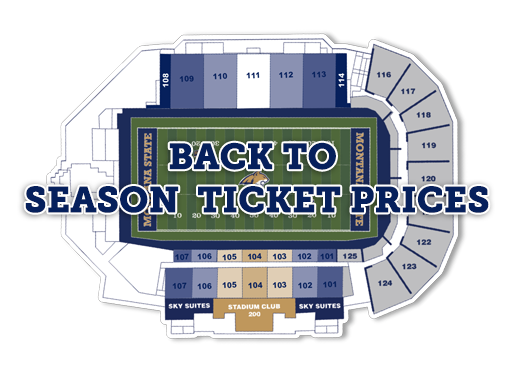 Please see the seat map on the home page for per seat annual Bobcat Club contributions and ticket prices. Please call the Bobcat Ticket Office at 406-994-CATS to see what is available. Call the Bobcat Ticket Office at (406) 994-CATS (2287) to place a $100 down payment on new 2019 Football Season Tickets. The ticket office will begin calling those who made deposits the second week of May to select seats. Calls will begin approximately June 4, 2019, and will be made in the order deposits were received. Deposits are non-refundable and non-transferable. Single game tickets typically go on sale beginning of August. Priority points provide an objective and equitable way for the Bobcat Club to identify and reward the most active supporters of the Montana State University Athletic Department. The goal is to reward consistent, annual contributors with added opportunities for access to premier MSU events and postseason games, as well as priority for season ticket and road game seating upgrades. Existing season ticket holders will have until May 1, 2019, to pay their Bobcat Club per seat annual contribution, purchase their season tickets, and secure reserved parking and tailgate spots. We have always attempted to be fair to all who contribute to the Bobcat Club Annual Scholarship Fund when it comes to allocating benefits. In the past, allocation was only based on annual contribution levels. With the new program, we are recognizing additional ways in which donors support athletics while still emphasizing the importance of contributions made to the scholarship fund. With the inclusion of consecutive years of giving and contributions to sports specific giving, we are also honoring loyalty and dedication. Each Bobcat Club contributor's rank will be based on the total number of priority points compared to all other contributors. Once the priority points have been calculated, your accumulated points will be listed along with your name and account number on all mailings from the Bobcat Club. The best way to improve your ranking status is to increase contributions to the Bobcat Club Annual Scholarship Fund. Points and rank will be increased by continuing to give on an annual basis (consecutive years of giving), contributing to a sports specific giving group, creating an endowment, giving to a capital project, etc.